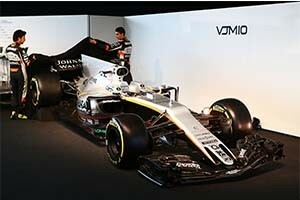 UK ITSP Voip Unlimited, connect the worlds media at the launch of Sahara Force India Formula One Team’s 2017 car. The Official Supplier, headquartered in Dorset, was commissioned to provide Superfast internet connectivity to enable global publicity of the ‘VJM10’. The launch took place today at Silverstone, where owner of F1 team Dr Vijay Mallya, Sergio Pérez, and Esteban Ocon took to the stage to unveil the new car. Finishing the 2016 championship in fourth position, Sahara F1 commissioned Official Supplier Voip Unlimited to enable global press to spread their news as far and wide as possible from the launch event, with IPv6 enabled Superfast connectivity. Voip Unlimited also provide the MPLS networks between the F1 Team’s Silverstone HQ and multiple locations. Established in 2006, Voip Unlimited is a UK based Internet Telephony Service Provider (ITSP). Voip Unlimited specialise in voice communications over IP and business data solutions, delivered over its privately owned reliable network designed specifically for voice and without compromise. Through trading for over a decade, Voip Unlimited have established a strong reputation for reliable, secure services and tailored solutions whilst still being cost effective. Customers include Formula One teams, Healthcare Institutions and Government Agencies. As a central supplier within the Voice over IP market, Voip Unlimited are known for reliability, speed and quality with experienced personable departments based in the UK able to design, deliver, install and support to first class standards.